Did you ever have a book you loaned out to someone, and you wanted to read it again and you just couldn’t remember who you loaned it to? I’ve done it lots of times. I love it when I think of a good person-book match. I want to pass along the pleasure of a good book. And I love it when people loan me a book they think I’ll like. Just so you don’t think I’m a saint, I’ve got a couple of them sitting reproachfully on my shelves right now. I went to get The Slaves of the Cool Mountains off my shelf. Gone. Loaned out. Because I’m writing a book partially set in Vietnam, I’ve read lots of books about Vietnam and the surrounding area. Slaves was calling out to me for a reread. I even tried ABE books to buy another copy, but being a very old and very English book (published in 1959), it was hugely expensive. It came back to me, miraculously – my father gave me a bag of books after clearing off a bookshelf, and there it was. I’d loaned it to him. It had been his book before mine, and before him, it had been owned by Felix Greene. He must have been the first owner, because the author, Alan Winnington, inscribed it to him. Both Englishmen, reporting on the changes being made by Communists in China. 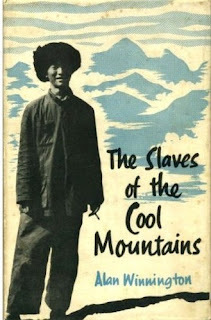 Slaves is Winnington’s travels into the mountainous southwest corner of China where the Norsu people were forced to free their slaves. He goes into amazing detail about the social conditions and the changes people were trying to absorb. Fascinating reading about a culture long since gone. Great black and white photos. Try a library search. I’d love to have you read it!